While I was biking around Medford the other day, this sign caught my eye now that Albany has begun experimenting with radar speed displays. The Albany radar sign, near the railroad crossing on Second Avenue S.E, has nothing to do with enforcement. It’s intended to shame drivers to slow down, even though as reported here on June 23 the average speed there — 28 mph — is hardly excessive. The Albany display just shows a vehicle’s speed. It takes no photos of speeding cars, and no tickets result. The same with similar displays on Spring Hill and Riverside. In Medford, on the other hand, they’ve had photo speed enforcement for many years. Retired officers operate a couple of photo radar enforcement vans that can be deployed around town. Offenders, usually drivers who go at least 10 mph faster than allowed, are mailed tickets. Since April, Medford also uses its red-light cameras at a couple of intersections for speed enforcement. The legislature authorized this in 2017. The idea was to discourage drivers from speeding up in order to avoid being photographed running a red light. Albany has only one set of red-light cameras, at Queen and Geary. When the legislation on speed enforcement (HB 2409) was pending last year, the Albany police told me they had no plans to equip those cameras to check for speed as well. 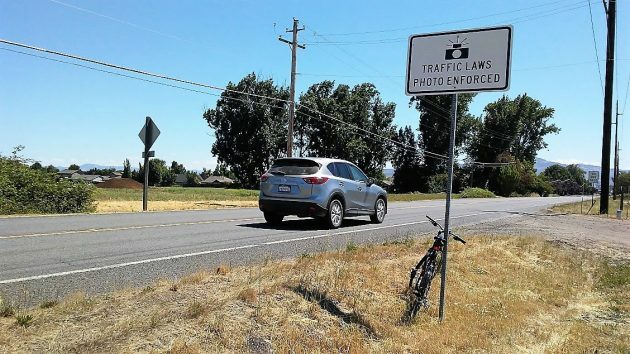 So for now, unlike in Medford and a few other towns in Oregon, the only speeding tickets Albany drivers have to worry about are those prompted by the reading on a radar gun pointed at them by an officer sitting by the side of the road. Don’t give them any ideas Hasso. I’m surprised they haven’t pursued this revenue source already! Two beautiful bald eagles were flying high over the Linn Co. Courthouse today. 6/30/2018 around mid-day. Where were you and your bike HH? Medford? Over 300 peeps turned out to STAND UP against the HORRIFIC 45 POLICY of ripping families apart. Oh so very un-family value. Oops I just called out the GOPee. The HYPOCRISY is starting to make a STENCH. Bodies decaying in the ditch stench. Anyways the turnout was pretty good for this little redneck river town. Made the Saturday market look like a ghost town. Back to the two bald eagles. They were amazing!! Gave me hope.